Evita Griskenas finishes 6th AA and 5th in Hoop event finals in the Sofia, Bulgaria World Cup! USA Group finishes 5th with 5 Balls! SOFIA, Bulgaria, April 14, 2019 - Evita Griskenas of Orland Park, Ill./North Shore Rhythmic Gymnastics Center, and the U.S. senior group finished in fifth in hoop and 5 balls finals, respectively, at the Sofia (Bulgaria) World Cup at the Arena Armeec. LJUBLJANA, Slovenia, March 31, 2019 - Evita Griskenas of Orland Park, Ill./North Shore Rhythmic Gymnastics Center, won the senior hoop gold and ball silver medals at the MTM Ljubljana (Slovenia) Tournament. CORBEIL-ESSONES, France, March 23, 2019 - Evita Griskenas of Orland Park, Ill./North Shore Rhythmic Gymnastics Center, won the senior all-around bronze medal at the Corbeil International Tournament, which concludes tomorrow with event finals at the Sports Palace in Corbeil-Essones, France. GREENSBORO, N.C., July 7, 2018 - 2016 Olympian Laura Zeng of Libertyville, Ill./North Shore Rhythmic Gymnastics Center, won the U.S. rhythmic all-around crown, becoming the first rhythmic gymnast since 1979 to win four-consecutive senior all-around titles, at the 2018 USA Gymnastics Championships at the Greensboro (N.C.) Coliseum Complex. INDIANAPOLIS, June 20, 2018 - 2016 Olympian Laura Zeng of Libertyville, Ill./North Shore Rhythmic Gymnastics Center, is seeking her fourth-straight senior all-around title at the 2018 USA Gymnastics Championships, the national championships for acrobatic gymnastics, rhythmic gymnastics, and trampoline and tumbling. Elizabeth Kapitonova of Staten Island, N.Y./Isadora, looks to defend her junior all-around title. 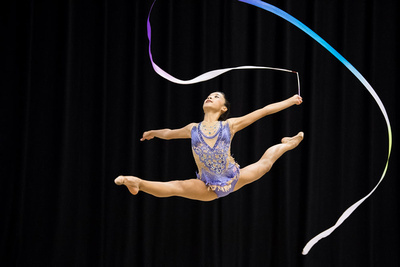 Lili Mizuno of Northbrook, Ill./North Shore Rhythmic Gymnastics Center, finished seventh in the all-around and qualified to the clubs final on the second day of competition at the Portimao (Portugal) World Challenge Cup. PORTIMAO, Portugal, May 13, 2018 - Camilla Feeley of Highland Park, Ill./North Shore Rhythmic Gymnastics Center, and Lili Mizuno of Northbrook, Ill./North Shore Rhythmic Gymnastics Center, both competed in two individual event finals at the Portimao (Portugal) World Challenge Cup. Feeley's 16.550 gave her fifth place in the ball final, with Mizuno tallying a 15.550 for sixth. INDIANAPOLIS, May 8, 2018 - 2017 U.S. all-around silver medalist Evita Griskenas of Orland Park, Ill./North Shore Rhythmic Gymnastics Center, earned four top-10 finishes over the weekend at the 2018 Guadalajara World Challenge Cup: sixth, ribbon; seventh, hoop; eighth, clubs; and tenth, all-around. The U.S.
MEDELLIN, Colombia, April 29, 2018 - 2016 Olympic alternate Camilla Feeley of Highland Park, Ill./North Shore Rhythmic Gymnastics Center, and Elizabeth Kapitonova of Staten Island, N.Y./Isadora, completed sweeps of the senior and junior rhythmic gold medals, respectively, today at the Pacific Rim Championships in Medellin, Colombia. BAKU, Azerbaijan, April 29, 2018 - 2016 Olympian Laura Zeng of Libertyville, Ill./North Shore Rhythmic Gymnastics Center, won the hoop bronze medal and placed fifth in the all-around at the rhythmic World Cup in Baku, Azerbaijan. The event is part of the International Gymnastics Federation's rhythmic gymnastics World Cup series. By Nick McCarvel Over three days and through 11 competitive routines at the 2017 World Rhythmic Gymnastics Championships in Pesaro, Italy, in early September, U.S. gymnast Laura Zeng had precisely zero drops. The three-time U.S.
PESARO, Italy, Aug. 31, 2017 - 2016 Olympian Laura Zeng of Libertyville, Ill./North Shore Rhythmic Gymnastics Center, and Evita Griskenas of Orland Park, Ill./North Shore Rhythmic Gymnastics Center, advanced to the all-around and event finals today at the 35th World Rhythmic Gymnastics Championships in Pesaro, Italy. PESARO, Italy, Aug. 30, 2017 - The USA's Laura Zeng of Libertyville, Ill./North Shore Rhythmic Gymnastics Center, and Evita Griskenas of Orland Park, Ill./North Shore Rhythmic Gymnastics, finished sixth and eighth in the ball and hoop finals, respectively, today at the 35th World Rhythmic Gymnastics Championships. It was the first time two U.S.
PESARO, Italy, Aug. 30, 2017 - The 35th World Rhythmic Gymnastics Championships began today at the Adriatic Arena in Pesaro, Italy, with qualification competition for hoop and ball. The USA's Laura Zeng of Libertyville, Ill./North Shore Rhythmic Gymnastics Center, and Evita Griskenas of Orland Park, Ill./North Shore Rhythmic Gymnastics, are currently first and second place in the all-around after three qualifying groups. 2016 Olympian Laura Zeng of Libertyville, Ill. and Karrine Denisova of Wilmette, Ill., both of North Shore Rhythmic Gymnastics Center, won the senior and junior all-around titles, respectively, at this weekend's Rhythmic Challenge in Indianapolis. In a northern Chicago suburb is a gymnastics center that holds a sisterhood of women headed to the 2016 Olympic Games in Rio de Janeiro, Brazil. At the North Shore Gymnastics Center in Glenview, Illinois, six women make up the first U.S. rhythmic gymnastics group to earn a spot in the Olympic Games. By Craig Bohnert | June 12, 2016, 11:01 p.m. (ET) (L-R) Alisa Kano, Kiana Eide, Natalie McGiffert, Kristen Shaldybin and Monica Rokhman qualified for the Rio 2016 Olympic Games in group rhythmic gymnastics. Each time rhythmic gymnast Laura Zeng steps out onto the carpet, her movements are smooth and elegant but precisely calculated, creating routines only a handful of athletes in the world could imitate. By Nick McCarvel PROVIDENCE - There was no rest for the weary on Friday night in Providence, R.I. In fact, there was no rest for anyone in what was a wall-to-wall evening of gymnastics at the USA Gymnastics Championships. MINSK, Belarus, May 22, 2016 - 2015 World all-around finalist and reigning U.S. champ Laura Zeng of Libertyville, Ill./North Shore Rhythmic Gymnastics, won two bronze medals today during the apparatus finals of the Minsk (Belarus) World Cup. The medals are the first for a U.S. competitor at the World Cup. Olympic hopeful Griskenas wins All-Around Senior National Qualifier. Orland Park high school freshman will compete in Nationals for Olympic gymnast spot Orland Park, IL - Sandburg High school freshman and honors student Evita Griskenas, 15, won All-Around Senior National Qualifier Sunday (May 15, 2016) at the Olympic Training Center at Lake Placid, New York.